Our super-strong racks are constructed with a solid wood 2X (made from a 2x3 or 2x6) bottom. The bottom rail is constructed of 1/2" OSB to prevent complete failure of the rack if a shell failed to launch (flowerpot). The top rail is constructed of 1/2" plywood (sanded 4-ply) cut with the grain. The bottom and top rails are also attached with staples, #8 screws and exterior grade wood glue. 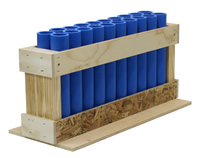 Our firework mortar tubes are made from the industry standard high-density polyethylene (HDPE) pipe. Please note: The 6, 12 and 20-shot racks may come w/o the base attached. The bottom plate must be attached to the rack before it can be safetly used. The base is pre-drilled and will include screws.